So quick question some people on miiverse are saying that the next update will delete your previous worlds is this true? No way, friend. Your old worlds are safe. That question is asked a lot. I tell them no all the time, if you have an older world, then starting a new one would be good if you want to see the full benefits of the update. My first world is almost hollowed out, so I doubt any update will fix that haha! I plan on starting a new world once it drops, I want to see all the changes! So.. has this happened to anyone else when using wire/switches? When the NOA patch is released, the game version will update from 1.01 to 1.03. We did this deliberately to sync up the NOE and NOA version numbers, so it didn't look like the NOE version had newer content. Version 1.02 does not exist for NOA territories, the content is all rolled into 1.03. I still don't have an update on the date. We're shooting for June 10, but that is not confirmed. 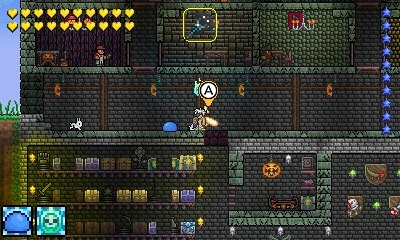 A week before school ends for me, even more hype with terraria 1.03! I hope, anyways. The chests, the jackoliers, the trophies and extractinator. A portion of their sprites get cut off when switching the jackoliers off. I thought it was already submitted? That is rather odd. Wiring and light sources seem to have some strange effects when connected together. I would assume it doesn't affect how you interact with the chests? Yeah everything seems to function just fine. Just a terrible eyesore is all. I know that a meteorite crashed into my asphalt bridge, and it made my heart lantern on it disappear, but I still get the heart lanterns effects there.